The first thing you should know: There is a learning curve. Linux is much easier than it used to be, but it's not Windows. If you're used to a Microsoft operating system, Ubuntu will take some adjustment. You also have to worry about applications. While there are plenty of Linux apps out there, you won't find the rich and powerful selection you can get with Windows. Just one example: There's no Microsoft Office. There is OpenOffice, of course. In fact, it comes with Ubuntu so you don't even have to install this free, open-source suite yourself. You can also use web-based suites like Google Docs. For many people, that's enough. But not for everyone. I've tried OpenOffice and Google Docs, and I've always been glad to return to Microsoft Office. I regularly use features, like Word's outlining, that the others just don't offer or don't manage as well. Ubuntu also comes with Firefox installed--a nice touch that will make many PC World readers feel at home. Speedwise, you won't have anything to complain about. Ubuntu is at least as fast as Windows. Probably faster. 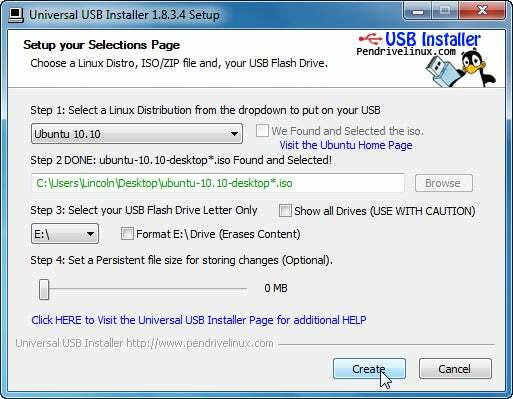 Put it on a flash drive: Download and run the Universal USB Installer. For Step 1, select Ubuntu 10.10 (or whatever the most current version is when you do this). If you haven't already downloaded the Ubuntu iso file, check Download the iso (Optional). If you have downloaded it, use Step 2 to tell the installer where to find it on your PC. In Step 3, tell it which drive is your flash drive. Be careful when you do this--the wrong answer could render Windows unbootable. Then let it do its work. If your PC won't boot from a flash drive, you can make it do so by changing the boot order. I can't tell you exactly how to do this because it depends on your BIOS. When you turn on your PC, watch for a message (one of the first things to display) that tells you to press a particular key (say, F2) for Setup. Press that key immediately for the setup menu. Search the menu for a Boot or Boot Order option. When you find the option, change it so that the USB ports come before the hard drive in the boot order. 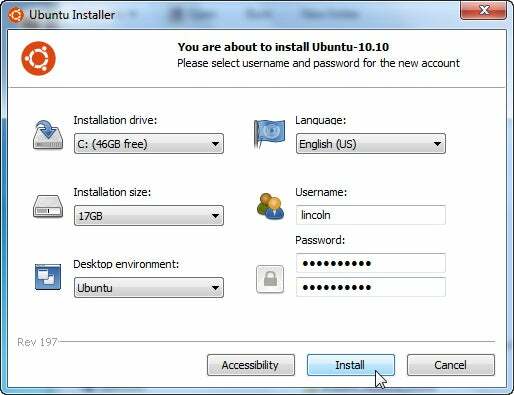 Install Ubuntu as a Windows program: Yes, you can do this. Just download and run Wubi. It installs Ubuntu on the Windows partition, creating a 17GB file that acts as a separate partition when you're in Linux. And how do you get there? When you boot the PC, the Windows Boot Manager will ask you to pick an operating system. And yes, you can uninstall Ubuntu like you can any Windows program. My thanks to Crazy4laptops for recommending Wubi in the original forum discussion.